It is not only lorries that cause traffic problems on the A259 around Rye. In the summer months visitors and day trippers in cars can, and periodically do cause gridlock. The worst congestion in recent years has been on a hot summer’s day when crowds flock to Camber Sands. On Sunday August 19 2012 and the weekend of July 6 and 7 2013, the traffic was at a standstill from Rye and Camber to the wind farm (five miles) on the A 259. On the first hot weekend in May of this year traffic heading for Camber caused tail backs on the roads around Rye. 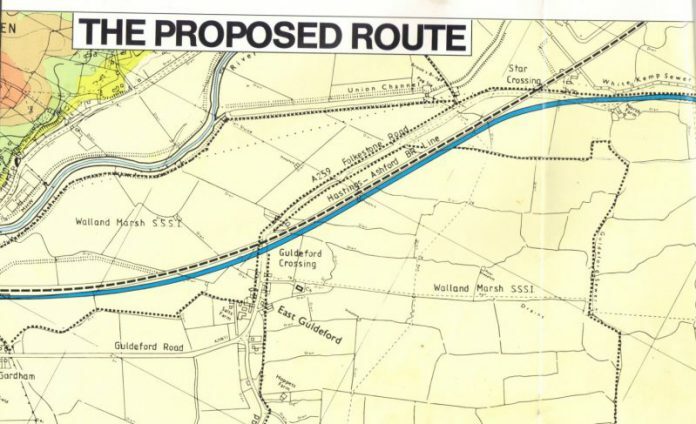 The first serious plan for a bypass in 1986 was to move the railway line some meters north and build the bypass where the railway line was. This was rejected by Ryers as it was felt that it would cut the town in two. Then in 1991 the plan was to bypass Rye to the south by constructing a tunnel under the river Rother using a Dutch method of temporarily diverting the river, digging a trench in the river bed for the tunnel to be built, then allowing the river to reclaim it’s original course. The plan to build a Rye bypass as well as bypasses for New Romney and Hasting was dropped by Mr Blair and Mr Brown when they cut spending on road building. A bypass for Rye would be a benefit to the environment and well-being of the community. Free flowing traffic causes less pollution than congested traffic. Tree and shrubs planted alongside the bypass would be a haven for nesting birds and there would be wide verges were wild plants and wild life would thrive. Tunnels under the bypass for badgers would minimise road kill. Also the bypass would have a green way for cyclists and predestines to use in safety. All this, however, is unlikely to happen in the foreseeable future but one way to ease the traffic congestion could be a link road largely following the corridor created by the railway line from Ferry Road to the bottom of Rye Hill near the junction with Military Road. It would give better access to the schools and any development of the College, supermarket and housing as well as to the railway station. here, too, there could be a green way between the road and railway for pedestrians and cyclists. which could be linked to the town by a underpass or bridge crossing the railway line. The link road could be partly financed by network rail when they upgrade the existing line also by the developers of any sites north of the railway. A link road could fit in with other improvements that are currently planned as a result of the proposed Mashlink upgrade and possible electrification. Network rail are proposing to close the two railway crossing East of Rye and to construct a road to the south of the railway line at East Guldeford to bypass them. The crossings need to be replaced (at a currently-estimated cost of up to £2 million) even if the line is not upgraded. The company that manufactured the crossings has ceased trading, making maintenance more difficult and the increased volume of road traffic over the years has also taken it toll. The A259 at East Guldeford is winding with sharp bends and not up to the standard of its status as a trunk road. It is in need of improvement and sections of the road are also subsiding into roadside dykes. Highways England have plans to underpin the road in the next two years. Well said Dennis Leeds George, all in Rye at the yearly council AGM, must voice their opinions,for and against a bypass for our town, after the town being completely cut off, in two major incidents this year, I think it is a must to lobby our MP to get a bypass back on the drawing board, sadly we have some in this town, that are still living in the 20th century, and as they do not live adjacent to the A259, will always oppose it. Well , when I floated the concept of a link from Kent ditch corner to the Rye Harbour Road at the annual town meeting in in 2015 I was shouted down & lost heavily on a show of hands including the majority of Rye town councillors .. Well that was the council make up then & the people present at that meeting ! If Winchelsea Rd / New Winchelsee Rd , South Undercliff , Fishmarket Road & New Road residents (yes people whom have lived (& suffered ) in Rye a long time whom also pay the Rye precept ) would attend the ATM on mass next spring . We might get a more representative view ..Bear in mind that with the Bexhill bypass already in place & the Ore valley road about to be passed , the average continental juggernaut operator (@ about 7 m.p.g.) is going to opt for a liitle hassle at Rye’s expense to go West on the A259 rather than up to & down from the M25 ..eBut the main reason I am pushing for this road is to take advantage of our god given opportunities in the Harbour, with an existing wharf & oodles of industrial space ,all it needs is good road communication from the channel ports to provide desperately needed real employment ..
Whilst I cannot fully appreciate the proposal from the map on my IPad , I can see merit in discussing it. The 259 is a difficult road along most of its route along the coast, but the E Guildford and beyond, section is particularly difficult as the corners are exstreme and the camber not quite right. If work is proposed on the rail line then this is a good and timely opportunity to discuss how to gain from the restructuring. The town Council is in the position to be the broker in what will be long term discussions and will gain status from being objective in enabling all possible options to be debated. Thank you Dennis Leeds-George, Paul Carey and J Tolhurst. As a Ryer and a resident of South Undercliff I can tell you that we are all dying literally and metaphorically to get a long awaited relief road. What with the continental juggernauts thundering through at all hours of the day and night, the volume of traffic, the speed of the traffic, the noise pollution, air pollution, the width of the road the bends the lack of adequate pavements and pedestrian crossings we feel neglected and aggrieved. Let’s all go to the AGM at the Town Hall in the spring.